Plus it's a non-binary phrase. Wall Street viscerally dislikes the non-binary. Sell/buy, put/call, bull/bear, risk-on/risk-off. These are the kinds of binary ideas Wall Street loves. Light switch ideas. The switch is on. The switch is off. Binary stories sell. Non-binary stories confuse. And when did Wall Street ever effectively sell to a confused customer? Which is why, when you hear pundits talking about the Great Rotation (another 2-worder) - code language for the big shift from bonds to stocks - you're expected to nod yes or no. Never say it's not so simple. Never. And yet... it really is... not so simple. Not because I can't make up my mind. But because reality has not made up its mind. Why isn't reality so simple? Aren't bonds at the end of a 31-year bull market with the US Government 10-year at 1.85%? Aren't interest rates going to rise, sending bond prices down? Isn't inflation - just around the corner - going to push rates up? Won't the Fed inevitably tighten if the economy grows? Aren't stocks relatively cheap at 14.2x estimated 2013 S&P earnings? Aren't dividends relatively high at 2.2%? Aren't corporations' balance sheets stronger than governments'? Isn't housing coming back now that "the S&P/Case-Shiller indexes [are rising] at [their] fastest rate since the summer of 2006"? Isn't the economy coming back with February 2013 unemployment down to 7.7%? Didn't I just read former bond funds are morphing into stock funds? Aren't stocks the only liquid investment place to left be? And - by the way - haven't I heard you - yes, you, John Allison -saying for months and months that stocks are the most attractive asset class? Yes I have been saying that - to answer that last question. And, yes, I still think stocks are the most attractive, high-liquidity asset class. And yet... it's not so simple. What's not so simple is this. Many are peddling the idea that we're beginning the next bull market. The only problem is: we've already had the first four years of it, if indeed it is a long-term bull market. Let me explain. The last genuine (18-year) bull market began in August 1982. Yet conditions prevailing at the start of the bull market of 1982 could not have been more different than conditions today. 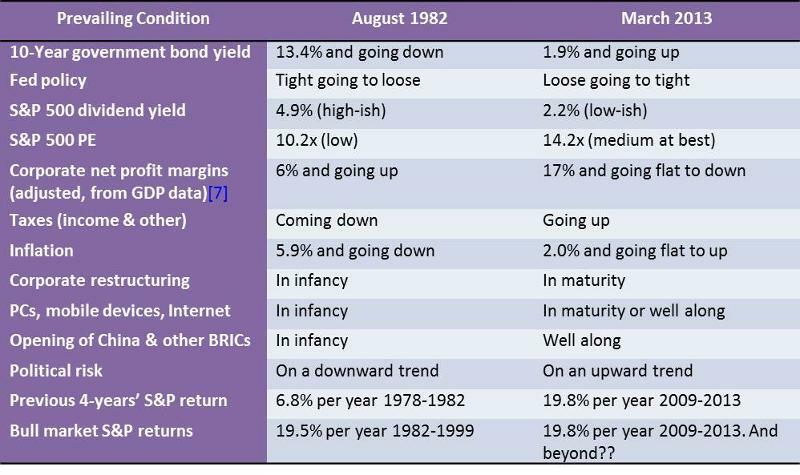 In fact, many conditions existing in 1982 are the opposite of those in 2013. In 1982, interest rates were high, going lower. In 2013, they're low, going higher. In 1982, Fed policy was tight, getting looser. In 2013, it's loose on the way to tighter. In 1982, the S&P dividend yield was high-ish at 5%. In 2013, it's low-ish at 2%. In 1982, the S&P P/E was low (10x) going higher. In 2013, it's medium (14x) going sideways. In 1982, adjusted corporate profit margins were 6%, going up. In 2013, 17% going flat to down. In 1982, taxes were high, going lower. In 2013, taxes are low, going higher. In 1982, inflation was 6%, going down. In 2013, it's 2.0% likely tending up. In 1982, corporate restructuring was just beginning. In 2013, it's nothing special. In 1982, the huge PC, mobility and Internet industries were starting. In 2013, besides shale gas, it is hard to see anything comparable. In 1982, China, Brazil and rest-of-BRIC growth were starting. In 2013, they're decelerating. In 1982, political risk was in a downtrend. In 2013, it's in an uptrend. In 1982, the S&P had experienced 6.8% per-year returns in the previous 4 years - 1978-82. In 2013, the S&P has experienced 19.8% per-year returns in the previous 4 years - 2009-13. In 1982, a 19-year bull market began that delivered 19.5% per-year returns (1982-1999). Spring is here. Take out your convertible. Put down the top. Step on the gas. Sit back, relax. Go for a nice long ride. Enjoy the sun above and the views all around. Not a bad suggestion... if you have a nice, big, empty highway to cruise on. But an imprudent suggestion if the roads you'd be traveling are mountainous, windy, rough and the weather chancy. Spring is here. Take out your convertible. Put the top down. But drive the winding roads carefully. Watch out for sharp turns and unpaved patches. Be prepared to stop at any time. Keep an eye out for gathering clouds and be ready to put up the top in the event of rain. Because of the differences between 1982 and 2013 cited above - plus other risks ahead I haven't laid out - the investor taking his capital out for a ride in the Springtime 2013 when the US stock market is up 10.6% in the first quarter - a 50% compound annual return! - has to determine whether the road ahead is the open highway under sunny skies or the winding road under variable skies. The simple view is that it's an open highway. The not-so-simple view is that it's a winding road. On either road, you drive the car. You just drive very differently in each case. "A blinding glimpse of the obvious... "
Back in 1990, I remember reading that phrase of Ross Johnson's (former CEO of RJR Nabisco) in Barbarians at the Gate, that great read of the then-largest LBO in history. Well... experience suggests that the obvious has diminishing value and hides more complexity the more obvious it becomes to more people. So I think it is with the Great Rotation. The most obvious thing in the world. I haven't, I can't and I don't deny it. Also, by the way, a great binary concept for marketers of bull markets. But investing is above all about reality - and especially about the unfolding reality of what has not yet happened. And from that vantage point, the Great Rotation is a phenomenon made up of many interconnected realities - some more hidden than others - whose unfolding is becoming less simple by the day.